¡La Chispa! Regional Bilingual Workshops are one-day events designed to teach leadership skills to middle level Latino students. ¡La Chispa! uses both English and Spanish to help students build self-confidence, strengthen their cultural identity and increase academic success. High schools throughout the state have hosted these middle level workshops in the past and have created leadership growth for high school students willing to help prepare for the event and serve as high school role models. 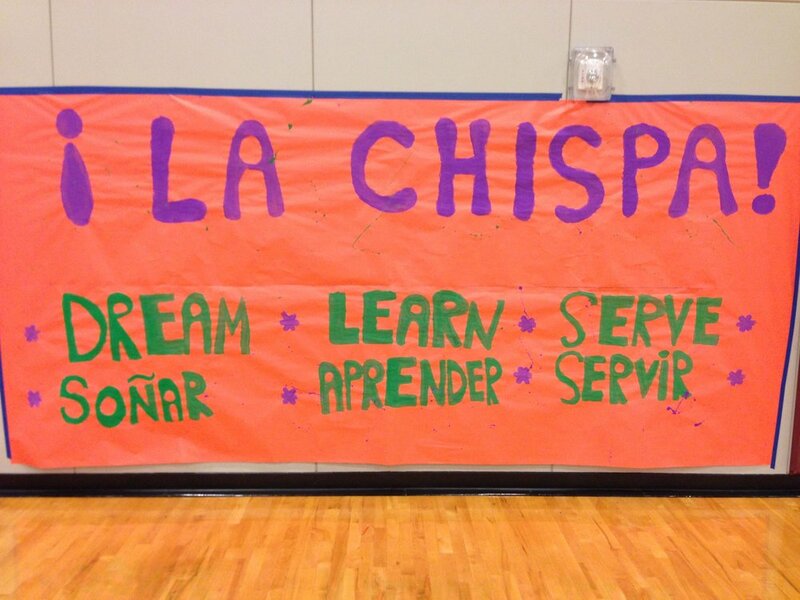 Each high school that hosts a ¡La Chispa! Regional Workshop helps serve between 100-250 middle level Latino students and creates a leadership opportunity for 15-20 of their Latino high school student leaders. Questions? Contact Vincent Perez, 360.497.5323 or fill out the form below. ¡La Chispa! ayuda a que estudiantes tengan confianza en sí mismos, fortalezcan su identidad cultural y aumenten su éxito académico. Tres factores que determinan el éxito del estudiante, los cuales son: adultos que son modelos positivos, la participación en la escuela y el servicio comunitario. ¡La Chispa! ofrece avance en estas tres áreas. ¡La Chispa! (The Spark) helps students build their self-confidence, strengthen their cultural identity and increase their academic success. Student success is largely dependent on three factors: positive adult role models, involvement in school and community service. ¡La Chispa! offers students advancement in all three areas. Hosting ¡La Chispa! at your school! Let us know your t-shirt size! What high school or college do you attend? Please choose the host-site where you will serve. Please arrive at 7:30 a.m. to help the facilitators set up. You will receive a T-shirt and a notebook with handouts, lesson plans and schedule. The day ends at 2:00 p.m. Confirm gym reservation, sound system with 2 microphones and ipod jack, 2-3 tables and 3-4 garbage cans (with permission to eat in the gym or adjacent area). Guide high school mentors on middle school outreach and press release outreach. Encourage students to document their volunteer hours and coach them on how to reach out to principals and the press. Create a space (notebook, cellphone note, etc.) to record your tasks and time spent on the ¡La Chispa! workshop for volunteer hours. Middle School Outreach: This can be in the form of a letter, email or personal visit. Be sure to use the ¡La Chispa! Registration Form during your outreach. Make appointments with principals of your feeder schools if you are going to visit. In a group of 3-4 visit the principal and make your "pitch!" ¡La Chispa! Press Release: A press release is a written communication directed at members of the news media. They can be mailed, faxed or e-mailed to assignment editors at newspapers, magazines, radio stations or television stations. We have created a press release template for each host-site. Reach out directly to each news source and be sure to prepare statements about your story and how ¡La Chispa! impacts you and your school. Watch facilitation videos and practice the activities. Prepare volunteer paperwork to be signed by ¡La Chispa! Facilitator or your adviser. Make plans to arrive at 7:30am on the day of your ¡La Chispa! Workshop.